In a slight departure from the usual, today I want to talk about totally licit art. Specifically, for those who are not familiar with it, I want to share with you the work of Marian Maguire. For several years now I have adored Maguire’s work. She combines the images and general mythology of Attic black and red figure ceramics with ideas and themes of the history of New Zealand. She creates an amazing world of combined mythology and history. 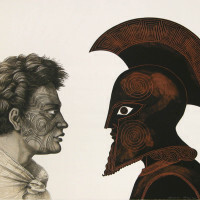 Like modern New Zealand itself, it is a mix of Western and Māori…Māori ideas pasted onto the Western, Western classic style peopled by Māori. 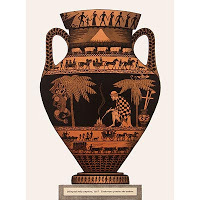 I think I squealed out loud with delight when I first saw her work.In honor of this blog actually having a theme (which is a little short of having a purpose but one takes what one can get) I’ll focus on her adaptation of one of our most favorite, most illicit-est antiquities. I had not gone far when a man of our company was shot. The Major went to his assistance, and was shot, the bullet entering the centre of his forehead. He fell dead on top of the man to whose assistance he was going. That was how Von Tempsky died. At least according to Wikipedia, Titokowaru’s people held Von Tempsky in high esteem, called him Manu-Rau and, most controversially, may have eaten part of him. Titokowaru’s people returned Von Tempsky’s sword to his widow (it now appears to be a magical sword of good luck somehow) and the location of his body was never disclosed. In what I think is a brilliant move, Maguire chose to portray the death of Von Tempsky on, yes, the Euphronius Krater. Von Tempsky lies dead while two warriors, one with a gun another with an axe, pull on his corpse. Titokowaru watches over the scene. At a simple level, Maguire cleverly portrays Von Tempsky as Sarpedon. At Sarpedon’s death, the Greeks are able to recover his armor (Von Tempsky’s sword), but the gods drop by and grab Sarpedon’s body (Von Tempsky’s body). It works amazingly well. Yet on another level, by selecting that backdrop, Maguire captures the contention and the controversy of Von Tempsky’s death and, of course, the complicated idea of “return”. 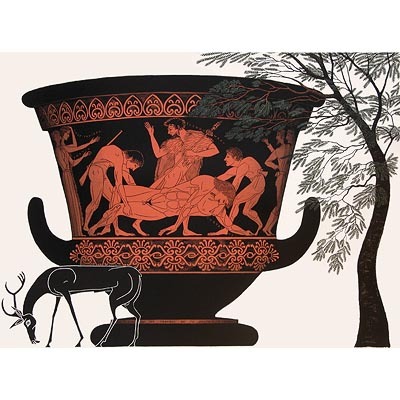 Like Von Tempsky’s sword, the Euphronius Krater has been returned to an heir of sorts, yet something is missing, something has been lost forever. The Krater’s looting and decades of controversy will hang like a dark cloud forever, as will Von Tempsky’s missing body and the allegations of cannibalism. I am about to spend a pretty penny (that I don’t really have) to buy two catalogs of Maguire’s work. They are a wonderful thought exercise, at least for those of us who love attic pottery, issues surrounding colonialism and Indigenousness, and New Zealand. Here’s to Marian Maguire for making my Monday morning magnificent. Please, if you are Māori, don’t get mad at me for writing that. While discussion of cannibalism may have been a form of “Otherizing” and projecting Western concepts of “savagery” in the past, I don’t play that game.